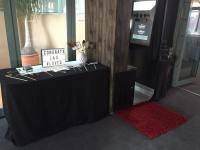 We currently offer two styles of photobooth. One is a traditional hard-walled style black booth and the other is a free standing kiosk with drop screen. Completely portable, it will will a space of about 1m x 1m. A trolley can be used to move the booth into most venues. All we require is level ground and access to power. The machine is best kept undercover and can be set up quickly. Fully automated and operating on timers, the booth is simple to use with just the press of a button, within seconds it will produce high quality digital images in colour and/or black and white. Each session prints two photostrips so you can share the experience. The photostrips can even be personalised with a logo or message. We have package options available, but we can also tailor a package that best suits your event.